For cats to be a “beneficial urban predator” they must largely kill the exotic predators and competitors of native animals. Dr. John Flux believes his 17-year record of the prey one cat brought to him  proves that cats are good for native wildlife in cities. 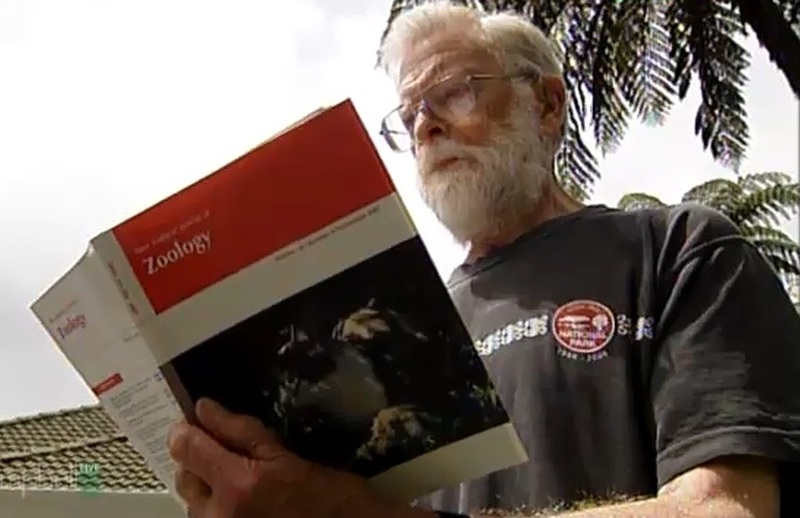 His belief featured prominently in the media to have a major influence on the public debate about cats and native wildlife. But John’s assertion depends on the observations of a cat that lived where most potential prey were introduced, exotic animals. What do cats kill when exotic prey is less common or native prey more common? 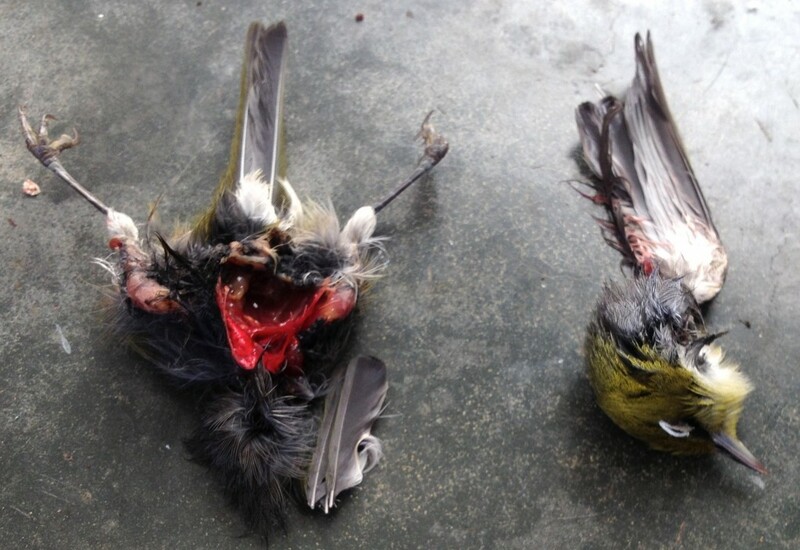 Silvereyes, like the one pictured after its encounter with a cat, were the most common native bird killed by Dr. John Flux’s cat. They were also the most common native bird in John’s garden, although exotic bird species were more common still and more commonly killed. What would John’s cat have killed if exotic species were less common and native animals more common in his garden? If we aspire to have more native species in our cities, and fewer exotic species, then what John’s cat brought to him is not informative (image by Dr. Phil Garnock-Jones). The science of ecology established very long ago that the availability of prey to a predator has a large influence on what it kills. Domestic cats are primarily opportunistic hunters first and choosey only secondarily . John and his cat lived in a highly modified, impacted semi-rural landscape . Their small half-hectare property was surrounded by paddocks of grass for domestic livestock with scattered patches of scrub that was mostly gorse, and a pine tree plantation. The pine plantation’s understory, and about half John’s garden, was regenerating native bush but the rest of his garden was a grassed orchard. The most common animals in John’s garden, therefore, were introduced exotics , especially mice, rats, hares and rabbits, two species of sparrows and blackbirds, starlings, song thrushes, and three finch species, and yellowhammer. The only native bird that was similarly common was the silvereye and so it is no surprise that they were also the native bird mosts killed by John’s cat. What do cats kill where exotic prey is less common? Not all places are good habitat for exotic animals. The density of exotic prey for cats will vary across the urban landscape because of variation in the availability of resources like food and water, and variation in the risks of death, like busy roads. Moreover, on our farms, and in our towns and cities, people control many introduced animals already because they are threats to health, property, and income. Mice and rats are common targets for control. Thus, the availability of exotic prey for cats can be depressed in some places. Where exotic animals are less common, cats will turn their attention to killing something else. I expect that where exotic prey is less common cats will kill more native prey. … and we are restoring native animals. The communities of New Zealand’s cities are making extraordinary progress at bringing our native species back to the places we live, work, and play–largely because we are controlling their predators, especially rats and possums . – 25% of residents did both. What do cats kill where native prey are more common? Native wildlife is becoming increasingly common in our neighbourhoods. In the future our farms, towns and cities are going to be more populated with native species–we want them there. As native animals become more common, cats will kill more of them. Do we want our good work undone? – cats will kill more natives if and when they are available. 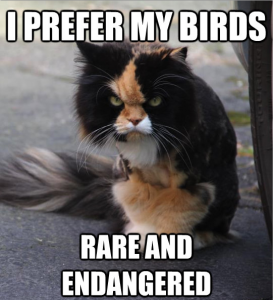 Cats that live where native prey is more common will kill more native animals. Cats that live where exotic prey is uncommon will kill more native animals. In the future, when our cities are home to more native species, cats will kill more native prey. Improving the environment for our children, grandchildren, and beyond depends on thinking into the future, not the pest-infested past. What one cat killed from a landscape infested with exotic animals is not necessarily what cats kill in other healthier landscapes–the city landscapes of the future. Let us think ahead, not backwards. 1. Flux JEC. 2007. Seventeen years of predation by one suburban cat in New Zealand. New Zealand Journal of Zoology, 34:289-296. 2. Barratt DG. 1997. Predation by house cats, Felis catus (L), in Canberra, Australia .1. Prey composition and preference. Wildlife Research, 24:263-277. 3. Miskelly C, Empson R, Wright K. 2005. Forest birds recolonising Wellington. Notornis, 52:21-26. 4. Charles K. 2013. Urban human-wildlife conflict: North Island kākā (Nestor meridionalis septentrionalis) in Wellington City. Victoria University of Wellington, School of Biological Sciences, M.Sc. Thesis. 5. Brockie R, Duncan C. 2012. Long term trends in Wellington City bird counts: 1969-2006. Notornis, 59:1-6. This is another side of a story about cats, which I think a lot of cat lovers will not agree with. I believe cats can be taught even to eat and not to eat, it really depends on how animals are bred just like an aoudad sheep hunting, just like how http://www.huntingtexastrophies.com is doing it.